As woodworkers working with traditional hand tools we are concerned about our workbench. How does the workbench affect the way we work and what tools we chose? Tomas Karlsson and I work on PhD projects in the craft who are called «snikkar» in Norwegian. The word could have a more general meaning as woodworker, but are usually used to describe a joiner, or a cabinetmaker (møbelsnikkar). We are both trained in the craft and have several years of experience. Tomas live and works in Sweden and I live and work in Norway. I have a PhD scholarship from Høgskolen i Sør-Trøndelag (Sør-Trøndelag University College) which have an undergraduate programme in building conservation and restoration. There are no postgraduate studies for craftsmen in Norway. I have chosen to join the experiment with postgraduate craft studies at the Department for Conservation at University of Gothenburg, Sweden. There are also a craft laboratory at the University. Tomas had already started when I joined. As we are working with similar kind of work we have found it rewarding to cooperate. We are both trying to spend as much time as possible working with our craft. Still we have to do some writing. Tomas have finished his licentiate thesis, «Ramverksdörr – en studie i bänksnickeri». The object of the study was to reconstruct and document historical techniques and methods for the manufacture of a door with hand tools from the time before joinery was mechanised. Drawing of the «normal» modern «høvelbenk» from the book: «Snekker» of Trond Gjerdi. (Gjerdi 1984). This bench has very typical details for Norwegian and Swedish workbenches. We want to use this blog to do a research about older workbenches that where before this bench became a «standard». I am currently working with my thesis and will continue for some time yet. I have written some papers that I have put on my personal page on Academia.edu. There you can read or download the articles. I does also have a Youtube channel where I post smaller video`s of what I do. We are writing in our own languages, Norwegian and Swedish. This is an important part of our work with this blog. Today joinery and cabinetmaking are becoming more like an international craft. Books, DVD`s, Youtube and blogg`s about the craft and for craftsmen are mainly in English. There are a lot of craftsmen in smaller countries around the world that are inspired by this wealth of material. That is very good for the craft and the craftsmen, but there is also a risk. The smaller languages, as Swedish and Norwegian, could loose terrain among the craftsmen. When you learn from an English book you will learn the English terms. Therefore we try to revive the terms in Norwegian and Swedish by using older and unusual terms in our blog. As woodworking have been very common and also specialized a long time back in history in Norway and Sweden there a lot of good terms. This could also benefit the crafts knowledge in general, also for English speaking craftsmen. We try to write some post`s in English to reach you English speaking readers. We have sorted these post`s in its own category. 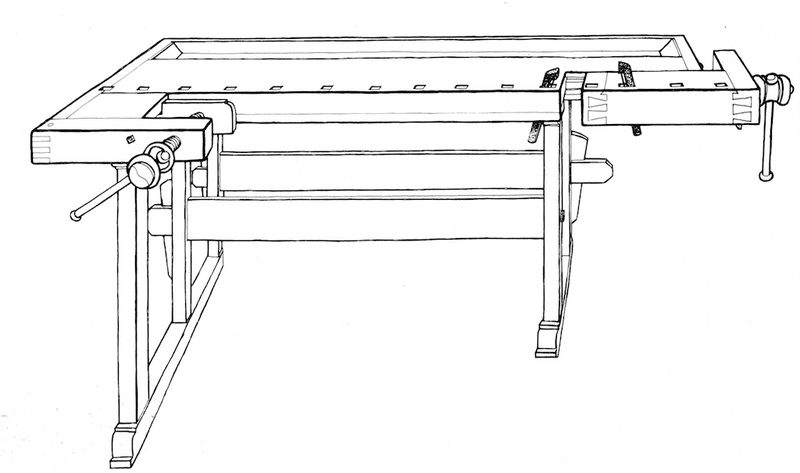 Jointing bench or shooting bench as English trasnlation of skottbenk? thanks for the photos and drawings,Ifind all this very interesting. My way of thinking is very similar. I’m in my 40’s, Portuguese, and I’m an «on-line apprentice» for this kind of craft. So the vast majority of information I found is in anglo-saxon world, but I’m still digging in the old Portuguese ways and words. All the best!